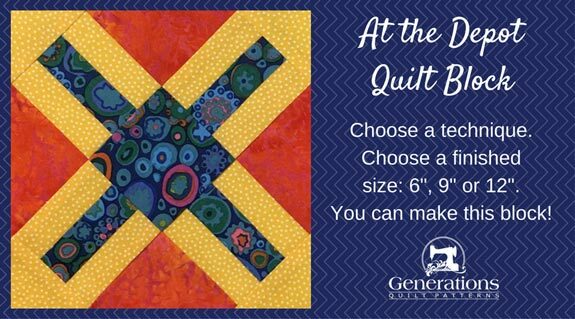 Get on board for the 'At the Depot' quilt block. 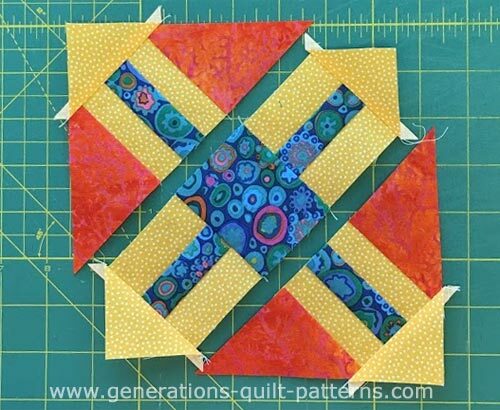 This charming little block is can be made using the On-Point ruler or with templates. The choice is up to you. Simple Rail Fence units, half- and quarter square triangles is all it takes. If you're not a Gadget Girl, I've got your back. It's cents-less to buy another specialty ruler just to try out a single block! 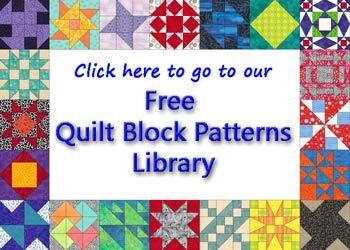 There's templates to download for the same three block sizes. 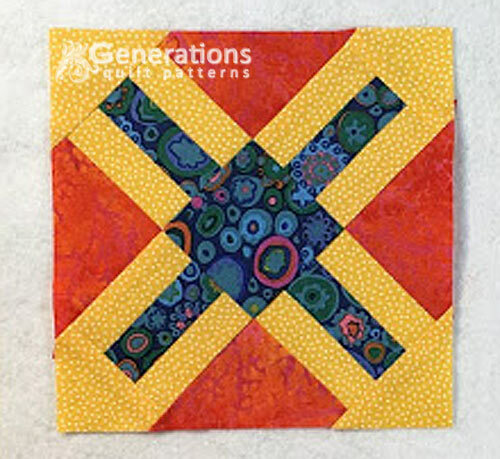 If you've been quilting a while, you might also know this design as 'Railroad Crossing'. Let's start 'At the Depot'! SA are pressed toward the dark fabric unless otherwise noted. 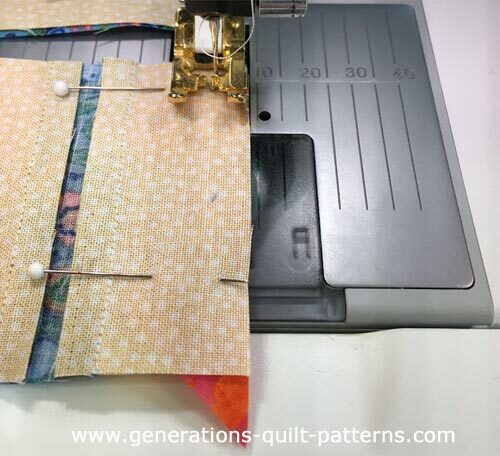 Starching your quilt fabric helps to tame the bias edges of the #3 and #4 patches and minimize stretch. If you don't have an OPRuler and would like to purchase one, links are provided with the picture below. If you choose not to purchase the ruler, you can print templates for your At the Depot from the chart below. You'll need one copy. 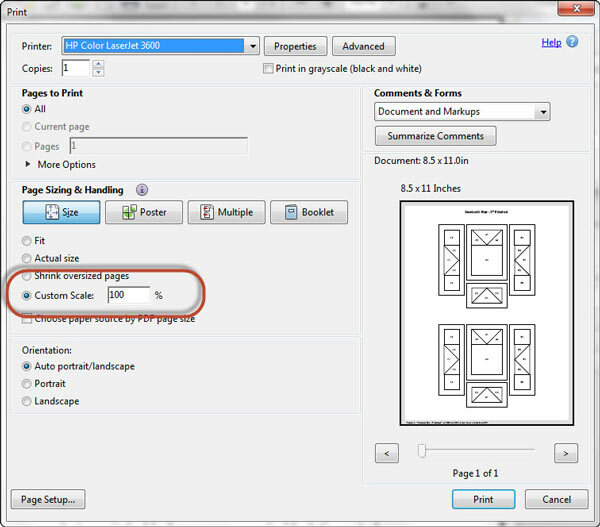 On the Adobe Print menu, under 'Page Size and Handling' set 'Custom Scale' to 100% before printing for accurate results. 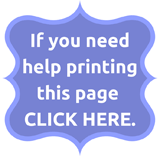 Click here to see what it looks like on the Print Menu page. The download for the coloring page is here. Choose three fabrics with nice contrast. My sample's patches are cut with the OPRuler. Learn more about it here. In the chart below, #1, #2 and #5 (highlighted in yellow) are cut with the OPRuler. #3 and #4 (not highlighted) are cut with your standard rotary rulers. 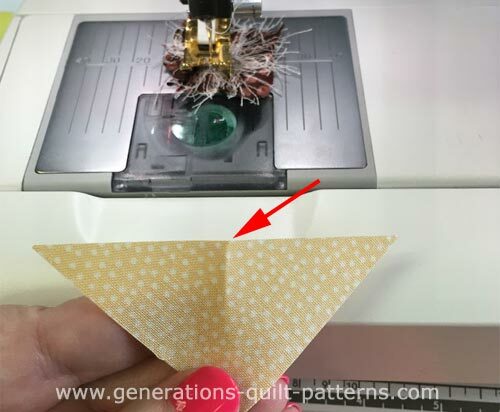 If you downloaded templates, the quantity to cut and fabric choices are marked right on the template. 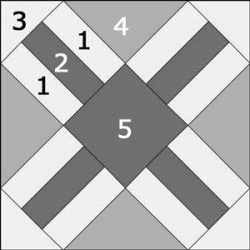 3	 Light	 2	 2⅜"	x	2⅜"	 3⅛"	x	3⅛"	 3⅞"	x	3⅞"
4	 Medium	 1	 4¼"	x	4¼"	 5¾"	x	5¾"	 7¼"	x	7¼"
#1, #2 and #5 are cut with the On-Point ruler for accuracy. Templates are available for you to download from the blue chart under 'Construction Instructions'. Choose which alternative works best for you and your budget. Remember to subcut #3 and #4 as directed. 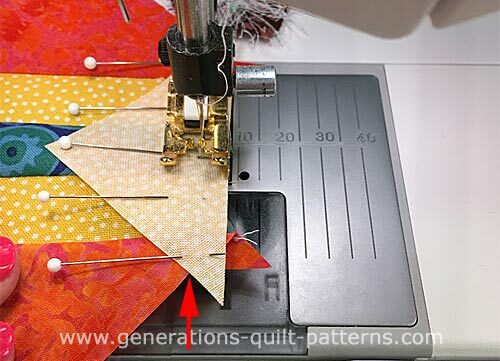 If you cut your patches with templates, sew a #1 to each long side of a #2, pressing in between stitching. After your four units are complete, they should be the same size as Template #5. Adjust as necessary. 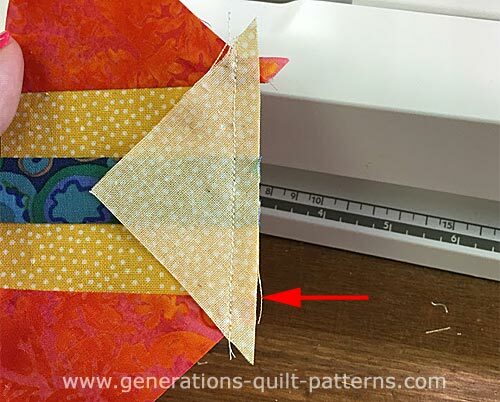 If you cut with the OnPoint, then with RST, sew a #1 and #2 together along the long edge. Love my quarter inch foot with a guide for stitching strips together! 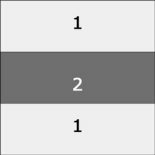 With your OPRuler check that your strip set is the correct width using the chart below. Straighten the short edge of your stripset. 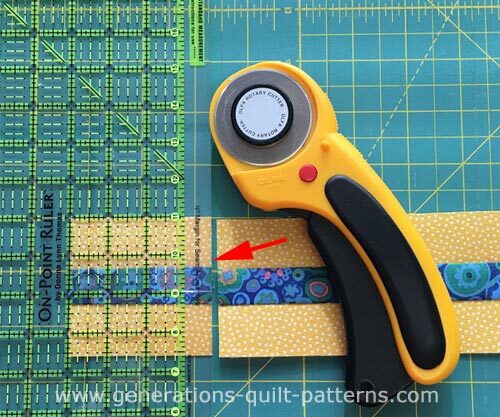 Line up a line on your ruler with one of the stitching lines (red arrow) and trim off just a bit for a clean, even edge. The right edge of this ruler is clear and hard to see in this photo, but it is right where the cut is. 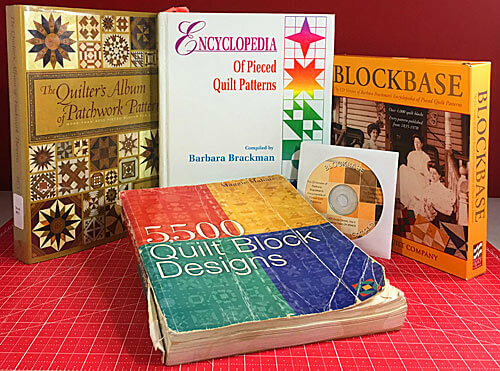 Sub cut your stripset using your OPRuler and the dimension from the chart that corresponds to your finished block's size. 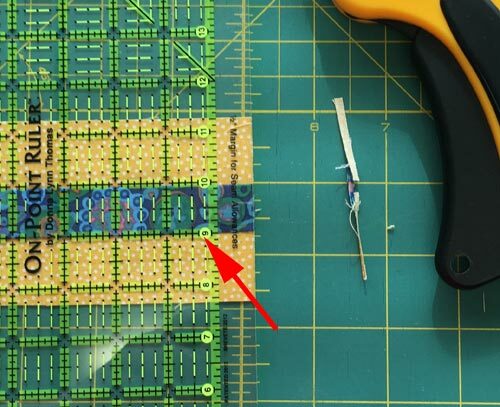 If you used templates, your RF are individually stitched and should measure the same size as the #5 template. Make adjustments as needed. Use the OPRuler to subcut patches. You end up with four perfect RF and just a bit leftover. From this point forward, regardless of how you cut your 'At the Depot' patches, the steps are the same. Arrange your patches as shown below. The Rail Fences point out from the center. 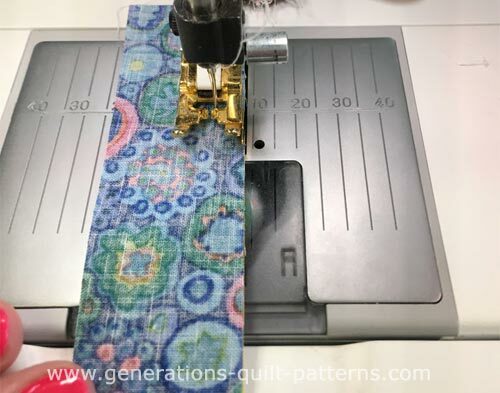 To assemble your At the Depot, we'll stitch these patches into two 'corner' type rows and one center row. First, with RST add a #4 to each #1 patch of two RF units. I like to start my stitching from the nice even edge. That way my machine doesn't crud up the points. Press, SA toward the darker #4s. At this point the #4 triangle are a bit longer on the pointy edge than the RF. This is correct. Now fingerpress to mark the center (red arrow below) of the long bias edge of all four #3s. Fingerpress a crease into the #2 patch of the two RF plus #4 units you've just stitched. With RST, match the centers of each. Pin to hold things in place. That little notch made by the patches (red arrow above) is right at 1/4" inch. 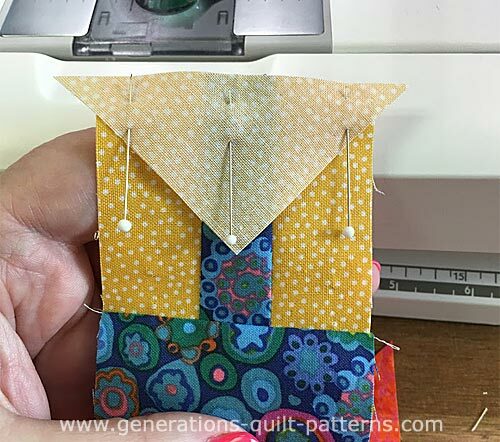 Your stitching goes right through this point at both ends. Below you can see it clearly. I've started trimming some of the dog ears (red arrow). Generally I do this as I go along. 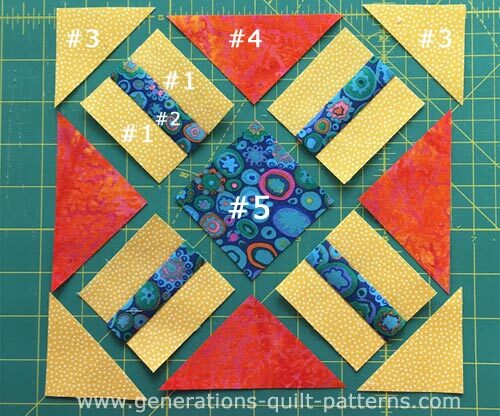 For the center diagonal row, add a RF to two opposite sides of the center #5 patch. Remember the RF point out from the center. Find the center of outside edge of the RF units and fingerpress to mark. With RST, match the center of a pre-creased #3 with the center of the RFs. Repeat of the opposite RF in this center row. Press the SA away from the RF units. All that's left it to stitch your rows together. 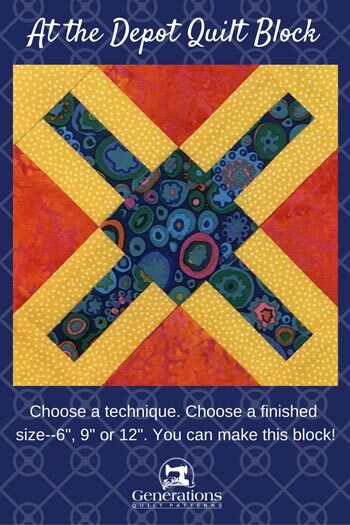 Your finished At the Depot quilt block! Beautiful. The train has left at the station. Our At the Depot quilt block is complete! Don't forget to pin these instructions for later.